The Histone Extraction Kit provides a simple method to acid precipitate histones from cell culture, tissue and primary cells (e.g. T-cells) while preserving histone post-translational modifications (PTMs). The highly basic nature of histone proteins often precludes them from isolation using traditional methods for protein extraction. Instead, histones must be isolated under acidic conditions to retain solubility. The inclusion of inhibitors helps to preserve histone modifications such as acetylation, methylation and phosphorylation. Each kit contains enough reagents for extractions from 2 x 96-well plates (192 rxns), or 100 rxns from cultured cell lines and tissues. Kits include buffers, protease inhibitors, phosphatase inhibitors, deacetylase inhibitors and optimized protocols for efficient recovery of core histones (H2A, H2B, H3 & H4). Histone Modification ELISAs – quantitative ELISA to measure changes in histone modification levels across samples. Histone Purification Kits – include additional column purification and precipitation steps for a more pure histone sample. Histone Antibodies – validated and verified histone PTM-specific antibodies for use in Western blot and ChIP. Active Motif's Histone Extraction Kit isolates core histone proteins (H2A, H2B, H3 & H4) from tissues and cell lines using an acid precipitation protocol that preserves histone post-translational modifications with the inclusion of phosphatase, protease and deacetylase inhibitors. For cultured cells either a one-step extraction or two-step extraction protocol can be used. Some cell lines are more resistant to cell lysis requiring the use of a two-step extraction method to first isolate the nuclei of the cells and then perform the histone extraction. Protocols are also provided to work with suspension cells, 96-well culture plates and tissue samples. A supplemental protocol is included when working with primary cells (e.g. T-cells). Core histones isolated by the Histone Extraction Kit can be used in downstream applications such as Western blot, Histone Modification ELISAs, or Active Motif's Histone H3 PTM Multiplex Kit. 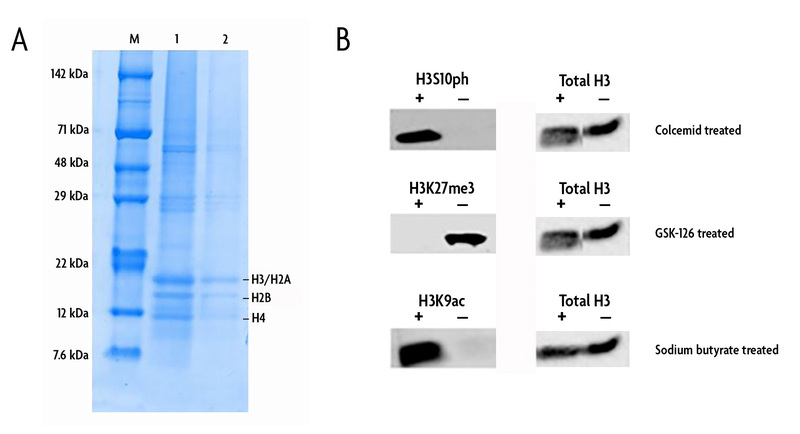 Figure 1: SDS-PAGE and Western blot analysis of histone lysates. A) SDS-PAGE gel using 20 µg mouse kidney histone lysate (lane 1) or 10 µg mouse kidney lysate (lane 2) shows histone lysate purity using the tissue extraction protocol in the Histone Extraction Kit. B) Western blot data using histone lysates isolated from untreated (-) and treated (+) HeLa cells that underwent a one-step extraction protocol. Twenty micrograms of each lysate was run per well and probed with a 1:500 dilution H3S10ph mAb (Cat. No. 39636), 1:250 dilution H3K27me3 pAb (Cat. No. 39155), 1:500 dilution H3K9ac mAb (Cat. No. 61251) and 1 µg/ml Histone H3 mAb (Cat. No. 61475). Results show the preservation of histone PTMs following extraction.